Families have always been important in Mennonite life. So it should come as no surprise that family histories are among the recent publications commemorating the centennial of the first arrival of the Mennonite people in the Red River Valley in 1874. The work of Peter Brown, entitled The Brauns of Osterwick may well be the most ambitious of such projects ever to be undertaken in our Mennonite communities. “The purpose of the book,” he wrote, “has been to lift a small corner of the veil from the conditions under which the Jakob Braun family and their descendants have come during the past century.” His three hundred pages given to carry out that objective in large measure do exactly what he planned. Eleven members of the Jakob Braun family originally arrived in a group of nearly 1,000 Mennonites at Dufferin near Emerson on July 15, 1875. They had come from South Russiathe Chortitza colonies in the mainas a portion of the larger migration to Manitoba occurring at the time. They were among the first groups to settle the West Reserve area (on the western side of the Red River) which was thus opened to settlement that year. 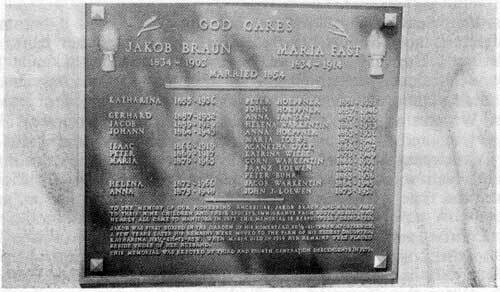 Nine children came with the familyKatarina, Gerhard, Jacob, Johann, Isaac, Peter, Mary, Lena and Anna. Within a year the family had joined eighteen others in homesteading the village of Osterwick, south of Morden and just east of the Pembina Hills. By means of extensive questionnaires and research the author has gathered a great deal of information about the Jakob Braun descendants appearing in the next ninety-five years. Many photos, personal anecdotes and documents relating to the life and work of these people add much interest to the book. Included, too, are a number of letters which the author got in response to his inquiries about experiences, family information, etc. of persons scattered throughout the provinces of Canada. Of special note among these materials is a list of the names of family heads in the July 15th group. The list cites the size of the families, and money paid by them for fare. There are also photo copies of pages from early village registers, accounts, etc., and a plan showing who owned the various homesteads in those years.